The class struggle between the ruling class and the working class through gentrification is reaching an even greater extreme in Nashville, Tennessee. 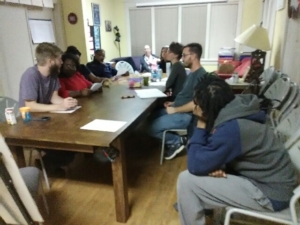 The People’s Alliance for Transit, Housing, and Employment is a coalition built by the local bus riders’ union, the bus drivers’ union, Homes for All Nashville, and Democracy Nashville to fight this battle in defense of the oppressed masses. The organization aims to ensure that low-income housing, living wages, and expanded bus service will be a part of Nashville Mayor Megan Barry’s new transit plan. 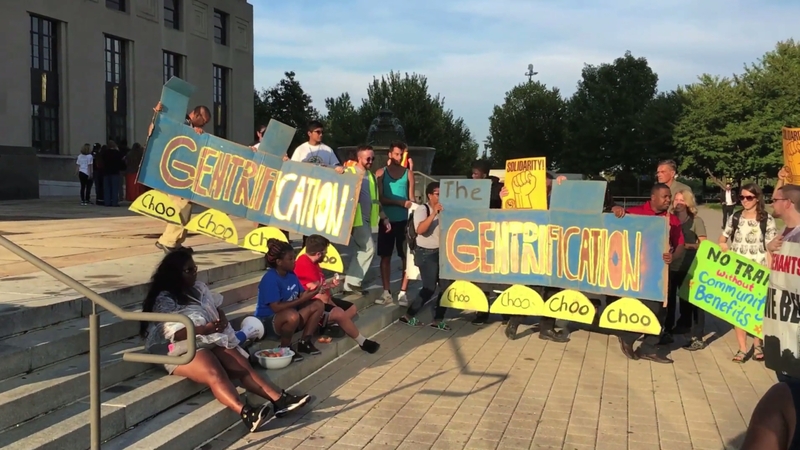 And because the organization is made up mostly of working class people of color, many in PATHE are directly affected by gentrification in the city. North Nashville has been the center of Black life in the city since the 1950s. During its heyday, many people shopped in the numerous businesses that peppered the area, worshiped in its churches, and danced in its live music venues. Additionally, Fisk University and Tennessee State University have long served as the academic bedrocks of Black Nashvillians. Yet, this section of Nashville is now being threatened by gentrification. The median household income in North Nashville in 2015 was $34,997. Yet, there are condominiums being built on this side of town that cost between $500,000 and $900,000. Old homes are being purchased for a fraction of their value before they are torn down and replaced with two or more expensive homes on what was originally one lot. One only needs to walk down Jefferson Street or through Germantown to witness this phenomenon. Another predominately Black section of town that is falling to a similar fate is East Nashville. Neighborhood change has increased dramatically since the early 1990s in this area. Now considered the new “It” neighborhood, East Nashville is comprised of Neoclassical, Victorian, and Gothic homes, along with new shops and restaurants catering to the emerging middle class. However, with the price of housing and rent steadily increasing in this section of the city, longtime residents are being forced to move. There are some alleged upsides to gentrification. Rundown neighborhoods are often made safer and cleaner, the tax base is expanded and property values increase. Moreover, new grocery stores, shops, restaurants, and recreation areas may be erected, potentially improving the quality of life for residents. Yet, the main problem with this type of neighborhood transformation is that longtime residents are often forced out of the community due to rising taxes and home values which they can no longer afford. Urban renewal hurts poor communities which are often people of color. Gentrification aims to revamp and develop neighborhoods by putting capital into them. New construction goes on in these areas with condominium developers and single-family home builders taking over vacant and neglected lots in the community. In an effort to maintain profits, builders and developers build high priced units despite the recognized need for construction of more affordable housing to accommodate the influx of new people moving to the city. Capitalist developers and real estate investors often misrepresent the value of a seller’s property, buy the property, then fail to help the seller find someplace new to move to. This is just one of the moral failures of capitalism. Nashville’s communities of color are being threatened even more with Mayor Barry’s new transit plan. The $5.2 billion plan, “Let’s Move Nashville: Metro’s Transportation Solution,” is the largest infrastructure project in the city’s modern history. It will consist of 28 miles of light rail being built throughout the city and rapid bus service. The ultimate goal is to have a light rail system with trains moving on their own tracks in East, South and West Nashville, as well as a downtown hub called Downtown Underground. A similar light rail project was done in Atlanta, and residents reported rent rose 150 percent over a five-year period due to rising home values and property taxes. Construction will begin in East Nashville if voters vote in approval of the project in May 2018. There are approximately 100 people moving to Nashville every day. So many people are moving to the city that Nashville is expected to look like Seattle in 10 years. There is already a recognized need for more affordable housing to be erected around the city. Indeed, the Mayor has even admitted that 31,000 affordable housing units will have to be built by 2025 to accommodate the influx of people. Change is to be expected in Nashville with so many people moving to the city. However, much of this change is occurring to the detriment of communities of color in the city. If the Mayor’s transit plan is approved, it is expected that many people living along the transit line will be forced out of their homes due to rising property taxes and home values. Developers and city officials are more concerned with generating a profit than they are with taking care of longtime residents. This is the nature of capitalism–the profits of the few always come before the needs of many. Housing is a right!